Material strength is the enemy in the design philosophy of the gravity balloon, as I have laid it out. Honestly, I think that it is always the enemy. It is one more thing that can go wrong operationally, it's not something one would like to rely on for safety. It also lacks a sort of elegance needed for the massive scales and volume of industrial replicability that is needed for massive zero-gravity industry of the future. Looking at both the approaches for the the task of tapering - bringing the friction buffer sheets into a smaller radius without defeating their economic point - I feel like I'm still missing something. 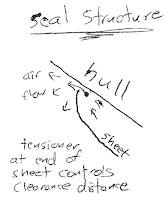 Neither of the designs I wrote about does a good job of eliminating the need for tensile strength due to the different radial acceleration of the air between sheets. On that point, I think I might have already conceded defeat. In gross terms, the extra tensile strength isn't actually a problem. It would pale in comparison to what the rotating tube's hull itself would require, and that would, again, be vastly less than a comparable fully 1-bar pressurized hull. No, I think the problem is requiring both strength and numbers at the same time. The failure modes are not good in that case. There is a level of material quality assurance that must be very robust. Additionally, it has intense tie-ins with the stability questions still outstanding for the many-layer hydrodynamic stability. Oscillation is also a problem if the friction buffers have good mass to them, and the idea of them as something more ephemeral has always been something much more appealing from an engineer's perspective. I have briefly mentioned a 3rd possibility in addition to the taper-nested and taper-zero options that I have been playing around with. You could basically combine the two. 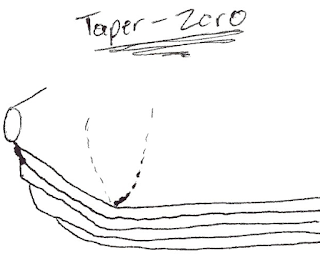 In particular, on the large scale I think that taper-zero is hard to avoid. It keeps the outer motion in the right kind of reference frame, the air ingress patterns give some very needed design flexibility, and it doesn't have those darned problems of undesirable connection points. It's the connection points that I think will sink the other design. So it's worth while following this rabbit hole for some time. Trash the taper-nested option. Start with taper-zero, and use something apparently exotic - a hierarchical type of design to them. I've used that word before, but I think that "group" might be better, because there would only reasonably be 1 layer to the hierarchy. The idea is that flow divider sheets are divided into 2 categories. One consists of infrequent "heavy" (although not all that heavy in absolute terms) dividers that hold a pressure boundary across its surface. These do substantial radial tapering toward the ends. The other type consists of a sheet that really has no material strength, and merely rests on air pressure. The connection points for the "flimsy" sheets are almost directly to the side, on the inner surface of their neighborhood "heavy" sheet. For the "flimsy" sheet, this avoids the problems of pressure ride-up in the taper altogether by outsourcing the task to the other type. For the "heavy" sheets, it consolidates the manufacturing and operations complexity by reducing the numbers to around maybe 4, when it might have otherwise required 20. This can also be a go-to solution for centralization of the pressure management of the "flimsy" sheets. I'm still not sure how contact might be maintained between the heavy sheets and the flimsy sheets. There might still need to be some tapering... but maybe not. I hope to return to this, and I'm sure I'll make a detailed post sometime after I can get around to sketching some of the basics and doing brief mathematics on it. I just want to throw it out there for now. I'm definitely thinking about it, and it absolutely has tie-ins to the most major problems of the gravity balloon design. I also find it interesting that this makes vastly more sense as you talk about larger and larger artificial gravity tubes. I've kept assuming a 500 meter diameter, but realize that might be too little. Once you talk about > 1 km, then the non-hybrid approaches start to look more and more unrealistic. Here, I hope to offer an alternative to the previous method I discussed for exchanging hot air from the rotating tubes to the edges of the gravity balloon (from where they would need to go through another heat transport mechanism into the space radiator on the surface). The potentially undesirable aspect of this is that the inner space has a great deal of clutter in the form of flow-dividing sheets. You could still have some holes in the sheets for travel of people and goods to go through, but the sheets would still be a nuisance. It would also be mostly mutually exclusive with large open spaces. Here, I am illustrating a pair of counter-rotating tubes. 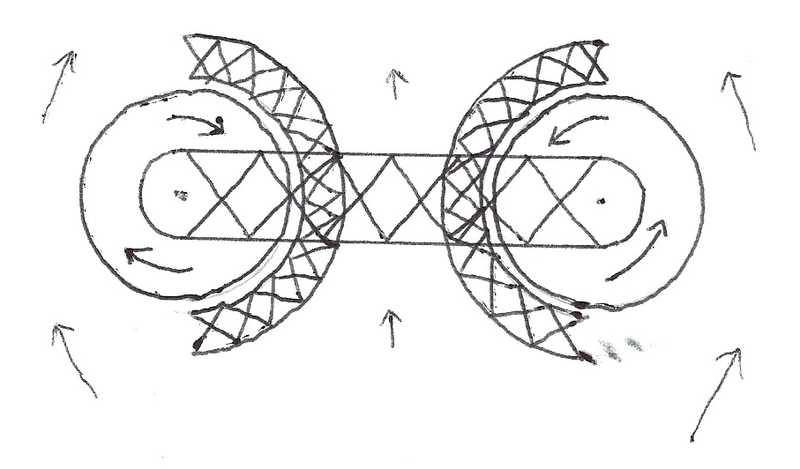 In the previous version of this idea, the air in the above diagram would be moving downward (by the directions in the sketch) within the space between the two tubes. The modification here is that we add a scaffolding around the surface of the tubes in this space. This achieves the goal of bulk flow in one single direction over a large volume within the gravity balloon. QUALIFIER: Someone unfamiliar with the broader gravity balloon concept in this blog might find it easy to mistake the motion depicted here as directly corresponding to the outer surface of the artificial gravity tube itself. Instead, this is only the outermost friction buffer layer, traveling at a few m/s, instead of on the order of 100 m/s, which would be the outer hull of the artificial gravity tube itself. What about the global circulation patterns? The air can't only move in one direction, it has to have a net loop in some sense. The best solution to couple with this design is to make the flow regions as large as possible, resulting in a "apple core" sort of circulation pattern. In this sense, there is one major river of flow going straight through the center, which fans out and goes along the outer regions to return to the other side and back again. The main challenges, as I see them, are the management of the integrity of the shape of the outer layer friction buffer. It is true that I expect some natural wedge effect to help maintain stability, but there will be more deformation caused by the significant asymmetrical drag on the inner segment. Intentionally putting asymmetrical forces on the outer layer will also push them closer to the limit of the stability criteria (whatever that specific criteria may be) and may also increase the drag forces. I started thinking about this topic more after seeing some artwork in the Accelerando blog. In future posts I do hope to provide more specific commentary and back-links those works. My intent here was just to put this concept out there. NOTE: extremely meta post follows. Several past posts have been a dump of a large set of topics all balled into one. Now, I would like to do something different. I have used a text file as a staging area where I battled ideas against each other (in terms of where they rank in priority) and also just spitball ideas to see what sticks. While I still like to do these things, I'm depreciating the text file as a tool. I would rather keep the extremely premature ideas on the back of a napkin (or email draft), and use the blog itself as a better format for medium-low effort writings. I attacked this concept from several different angles. One specific scale I was interested in was 1 km size asteroids, since these get closer to the NEA territory. Air pressure might still be used to resist against self-gravitation or some other uses, but exactly what is an open question. Nothing I've posted has come close to an exhaustive accounting of the stability topics which span from the gravity balloon part itself, to the internals, to the friction buffers. Then, multiply some of these by all the different size classes. Every problem you look at, you can probably think of at least five different mathematically simplified cases. Each one of those problems could have an enormous amount of analysis, and even radically different formulations. The moon of Mars is just too interesting to give up on. But fairly small, and also close to the Roche Limit, this moon also presents a host of different mathematics that can complicate its scenario. In spite of that, there is still a strong motivation to give definite values for some kind of maximally populated colony. Where does the gravity balloon exist within some kind of space roadmap? There are some efforts to make a detailed space development roadmap (I have one in mind that was on Kickstarter). These can offer an interesting starting place, but may be too near-term to have much connection to gravity balloons. The NSS also has some interesting roadmaps that involve extremely far-reaching development goals. I am interested in making an ordering. What is likely to happen before a gravity balloon is built? What is strictly necessary? Unlike most artist illustrations and typical guidance from 1970s era concepts, the artificial gravity tubes inside a gravity balloon would be extremely friendly for developers who want to build skyscrapers straight across the tube. In fact, it would be necessary if the mass was not evenly distributed (this is more important for gravity balloons, since the shielding mass isn't integral to the hull, making the livable structures relatively heavier compared to the walls). Where would sewage processing happen? Probably in tubes that don't have the burden of friction buffers (accomplished by spinning at very low rates). This seems perfectly fine for algae and other smaller and easy to manage husbandry of animals, etc. What other industry (like shipyards) would happen in the microgravity (but not airless) space? Probably lots. I address "air" in the basic physical sense a lot, but the chemical realities of production of air is more challenging. Given a large number of artificial gravity tubes located near to each other, they all need to fly in formation. A common picture of how to approach this problem is to have many orbital habitats in synchronized orbits. Since their mutual gravity is small, they all essentially trace their own ballistic orbit, and for many orbital locations (like some L4/L5 point) lots of stable non-crossing orbits exist. This does require some station keeping because we can not arrange the orbits with perfect accuracy to begin with. Another approach is to tie together several cylinders together to create a larger space station. Like many of these deep-future scenarios I write about on this blog, massive structures would be much better off without needing manufactured steel beams with high compression strength. At a glance, working around the constraints to achieve this ideal might sound impractical, but it's actually entirely reasonable. I will address both scenarios of 1.) the superstructure inside of large gravity balloons and 2.) a generic case for orbital habitats in typical vacuum conditions. These are quite different, but some of the underlying principles are the same. Let's get the first things straight - what specifically the engineering role for a superstructure is. While this blog might have hit on one or two of these roles, I have never faced them all in any capacity. Elsewhere, I have not seen much of any analysis or reference to the superstructure notion to begin with. 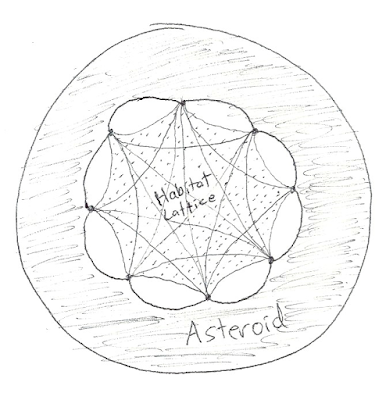 For a small gravity balloon, it might be completely reasonable to pull against a tether anchored into asteroid rock to maintain or start up rotation. On any larger scales, however, you would just use force-exchange with the neighbor cylinders for this task. Larger gravity balloons will see different physics in this respect. The tethers can be (and likely would be) held in place by the air pressure itself. This will demand some curvature of the wall, as I illustrate in the sketch below. Going further, there are many many more interesting things that need to be taken into account on larger scales. As scale increases, the self-gravitation effect becomes larger and larger and for something like Virga, you might very need to imagine something like carbon nanotubes in order to keep all the habitats from collapsing in on the center. For the superstructure concept to work, we need some form of control input. I have made several references to the generic type of technology whereby a tether can have slack pulled in (thus making it tighter) on command. This is the control machinery side of the equation - we also need good control signals. Simply put, on a large enough scale, the system must have more give than what simple material properties would allow you. As a counterpoint alternative, think about what the superstructure would be like if it were made of springs. This could accomplish most of what a control system could otherwise do. Momentum will be fully looked at as a commodity in this system. This implies it can be stored and transferred from one place to another as needed. There are large-scale balance equations that will eventually be satisfied, and a gravity balloon would presumably have an agency that followed these numbers (like the various energy agencies are to us on Earth today). Illustrating what I have in mind - tethers extend from the pressure liner into the habitat. These fork into different directions to connect with the different connection points (and have a curve so they can reach closer to the wall) and also with the rotating cylinders themselves. All throughout the middle space you must imagine a vast number of tubes. Each one of these tubes are connected into the tether network - and the tether network will do the work to hold them safely in place, depending on what the particular needs at the time and location are. I have drawn an empty space between the tethers and the liner. This isn't strictly necessary because you could just have more tethers connected to the liner. I did not go this route because I assume that additional connections would have an additional cost, but this is not strictly true. So you are free to imagine an innumerable number of tethers extending out from the wall and no "dead space" around the edges. Also, I am burdened by the need to illustrate something. 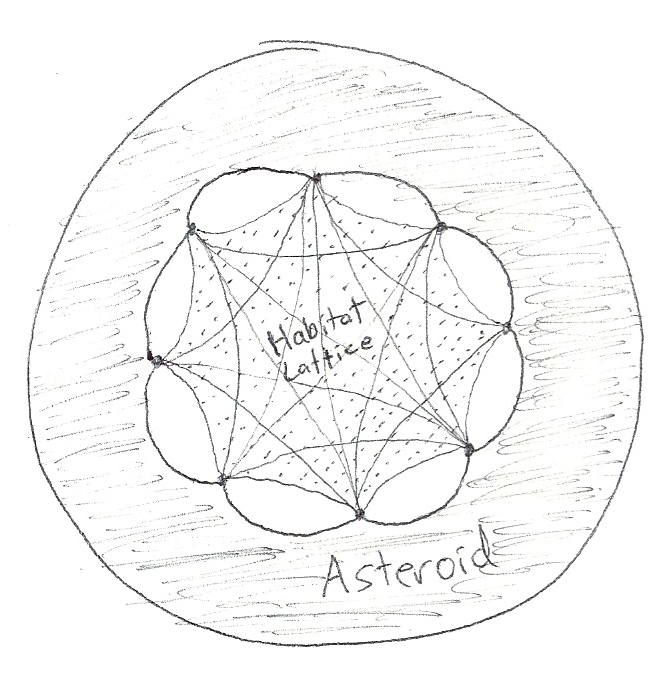 You must also use your imagination to picture a network of ever-thinner tethers that reaches out to each individual habitat in the entire volume, and connects (eventually) to the superstructure. In the cases I've described, air pressure is the "ultimate" tension force. That allows you to pull something away from the center. In an arbitrary orbital location, tidal forces might be one of the easily available options. Even a space elevator could be an extreme version of this. 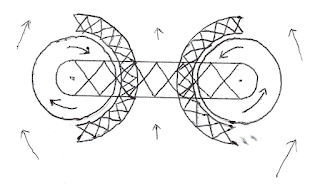 Going in another direction, an orbital ring can be used to pull in another direction. Combining tidal and the orbital ring tug, you could arrange habitats in a 2D plane which is essentially a disk around a planet. This structure could hold all the constituent colonies in place. But let me stress that in the radial directions, "anchors" are needed in order to get a good tug on the tether, while operating on habitats that have relatively small micro-g accelerations acting on them. These could also be very useful for other mega-structure projects, like solar power arrays, or electromagnetic launchers and catchers. These projects might need precise alignment, and you need something with which to act on in order for them to be viable. The disc-type megastructure might be the ideal option for that. Another option also presents itself (which I have sometimes briefly hit upon), you could have a large bag of low-pressure air that envelops a large space of orbital habitats just for the purpose of holding the tethers in place and keeping tension on them. This would enable massive 3D habitats, but would not allow free-air access to the different habitats. Since the latter (a full gravity balloon) requires access to a large mass source (a large asteroid), many locations would not have that option and may possibly find a space city of this type the best available option. Stability remains an issue - it is one of the core weaknesses of the proposition for the gravity balloon concept. The issue isn't whether the fundamental principle of laminarization will work, or even necessarily that the channel flow physics are suitable for this problem, but the behavior of a complex and fairly high-energy system. If you took a simplistic picture of the wedge effect, the prediction would be a slight restorative force for each layer of the friction buffers. The exact directionality of this force gets complicated. It gets even more complicated by the non-rigid nature of the buffers. What we should really raise our eyebrows at, however, is what happens when you consider all the numerous sheets in tandem. Loosely connected dynamic systems can be prone to failure, and this situation seems like a candidate for that. But then again, maybe not. The solution becomes fairly non-trivial. Due to the complexity of the problem, our only best option left is to perform scaled experiments. Ideally, we would like to use a fluid that is more convenient, in that the same flow patterns can be produced at a smaller scale. To do this, we will look at the Reynold's number. We would like something with a high density and a low viscosity (in particular, relative to air). It becomes fairly obvious that water is our best option for this. Also, you can see that we have 2 dimensions over which to flex our abilities - that is the velocity and the distance metric. Now it seems pretty clear that we want the smallest structure that we can spin at workable speeds. These 2 degrees of freedom would still dictate a massive scale of experiment, if taken to apply to the entire system all at once. By that, you can say that d is the diameter of the outer-most friction buffer (for example), and that the system will be a scaled model in terms of all geometric dimensions. The enormous cost of this nudges us to seek cheaper solutions that might go 80% of the way with 20% of the effort. In a more accurate accounting, I'm looking for something more like 10% of the ultimate discoveries with 0.001% of the effort. Obviously, we might instead take d to measure the distance between sheets, while also relaxing the requirement for strict geometric similarity. This might be nice in order to make something testable by reducing the number of sheets compared to the gravity balloon reference design. Thus, the overall scale and velocities will be dramatically less, while still demonstrating channel-to-channel interactions with the same flow patterns. This still won't be sufficient to make an immediately tenable experiment. We'll need to relax something related to the channel flow pattern itself. The obvious candidate is to change the channel width relative to the overall tube diameter. However, I will not count this as an independent variable, because I think that (for most cases) it will fall out of the selection of the number of sheets. In any format you choose, it's likely that the ratio of the overall thickness of the friction buffer region will be about 50% of the tube radius. So greater channel width will follow with fewer sheets. Our hypothetical experiment has been cut-and-slashed a lot by this point, but we're not finished yet! What is truly the really important point? What would we want to learn from this? I would argue that it is the interaction of multiple friction buffers in a (generally sufficiently) turbulent flow regime. Even if you cut that out, there's still some value because it answers some questions about this broader notion of friction buffers (which can even have other applications). 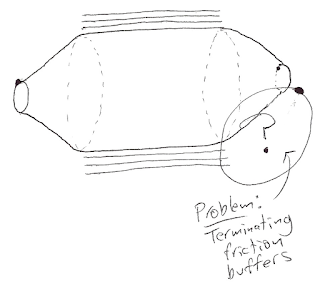 However, we do want to answer questions about the friction buffers used in a gravity balloon regarding their stability. We basically know that the answer will be different for laminar and turbulent (or at least somewhat independent). Let me illustrate my thinking in a sketch. Basically, we want to probe on the minimum edge of turbulent flow regimes with a multi-sheet friction buffer system. 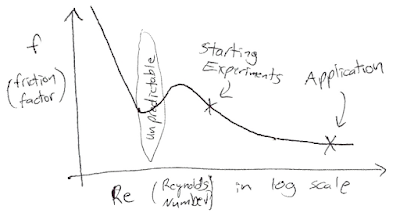 Just opt for an outright change of Reynolds number according to the abilities available for experimentation. This would be the 10% of ultimate knowledge I'm interested in. This would set the stage for everything that may (or may not) come in the future. The good news - all this slashing of the metrics gets our experiment size way down (the scale is highly sensitive to Reynolds number). And that gives us some wiggle room. With lower Reynolds number, we can play around with more sheets (even up to 10 or 16 as I'm dreamed about), while staying at least in the turbulent regime. With the same general equipment, dial the numbers the other direction, and see about higher Reynolds number channels with fewer sheets. Once you start chewing on this, something new starts to take form - a general format of the development path. Because as these numbers are dialed back up to the full scale (with more resources), its possible to speculate when many different components of the design will be proven in principle. After that, you can image at what point those components will mature into a representative suite of technologies. For instance, at certain numbers, the intra-sheet flow management will become testable. At another point later on, active controls for maintaining the seals could be strapped on. So now we've covered 4 (mostly) independent factors. 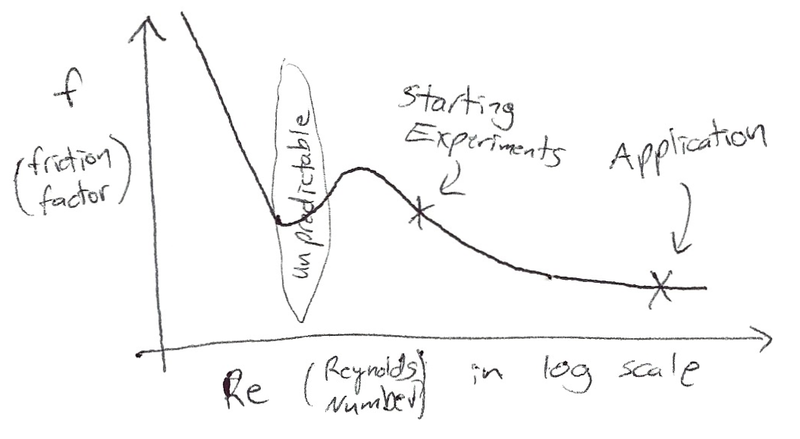 I think this is probably the right way to look at scaling of real, physical, experiments. These can start on a household scale. This is a fairly simple illustration of the problem that we start out with. 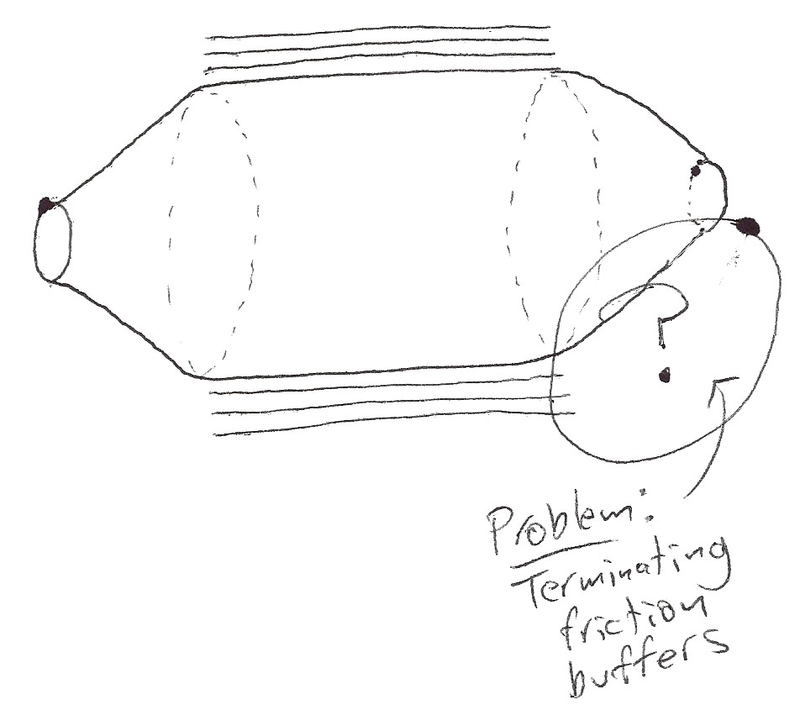 The friction buffer concept was conceived of essentially within a cross-section of a gravity tube and the surrounding sheets. As the ends of the tube's hull is pinched, so must the friction buffer sheets as well. The problem comes down to how we manage the geometry of the sheets in this area, as well as how we make the moving connection. Two solutions have presented themselves as relatively strong candidates for an ultimate solution. They both have a similar pattern to them. The sheets pinch in with both ideas, but in the "zero" solution they terminate against the next-inner-most sheet, while in the "nested" solution they terminate against the hull itself. 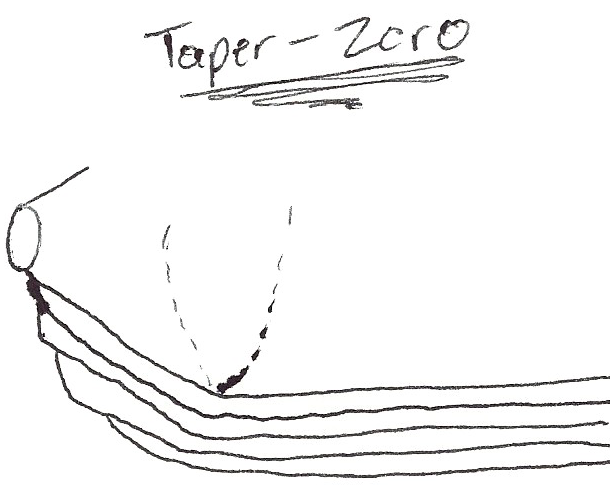 Here is a quick sketch of the taper-zero solution. Keep in mind that this is 1 quadrant of what is illustrated in the above problem sketch. 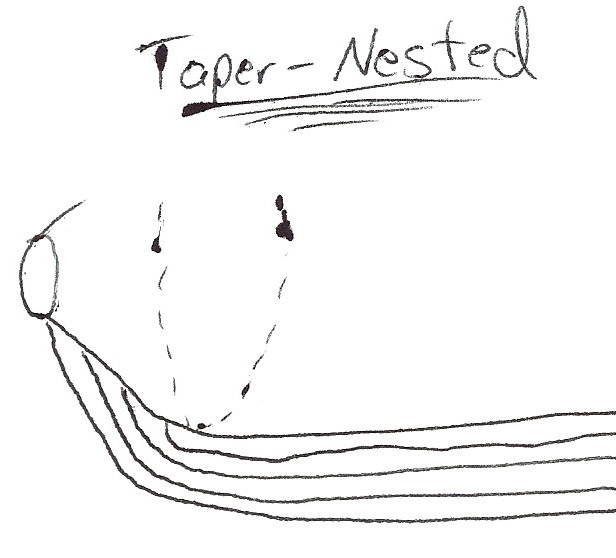 Here is a quick sketch of the taper-nested solution. The calculation for the connection points is different from the taper-zero, and this causes the connections to happen at small radii, and possibly face higher velocities at the connection points. An advantage is that connecting to the hull is probably easier, since it is a hard surface. 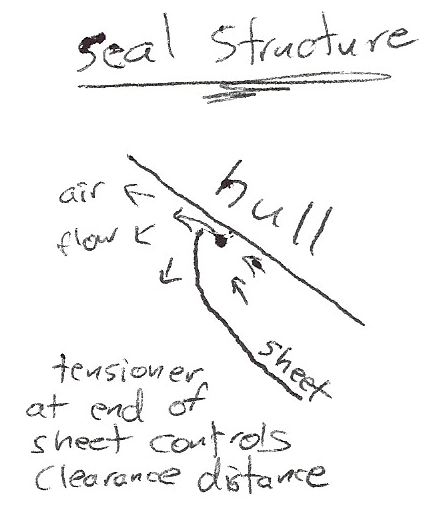 For the connections themselves, I envision a tensile tensioner acting at the end of the sheet in order to control the clearance and positioning of the sheet. This applies for both of the concepts. Hope these were fun to look at. I'm not much of an artist, but since the hand-drawn sketch is a popular style these days, I figure "why not" and avoid the tedium of creating these on a computer. Suffice it to say that a minimum viable case has been made for the engineering of the friction buffer connection points. However, the very day after I claim to have "solved" that problem, I noticed that another scheme is possible, and possibly even better. I will make this post as a brief introduction, and I apologize for the painful lack of illustrations this leads to. Let me clarify the naming - the names refer to whatever kind of logic sets the pressure around the (moving) connection points (seals). You can see that this, combined with the velocity constraint, forces all of the other parameters to follow suit. That's why this taxonomy makes sense. In the taper-zero scheme, all seals were approximately at ambient atmosphere pressure. Note that all friction buffer sheets are at a slightly positive pressure in order to maintain their shape with a controlled leakage, and this extra positive pressure is not accounted for directly in the math (partly because there is no lower-bound, and partly because it may be small enough to neglect). Once I ran a few numbers, it quickly became clear that option #2 leaves the majority of the connection points clustered very close to the end opening (at small radii to minimize the velocity difference between the sheet material and the faster rotating tube). After chewing on this a bit, I find that this sets the stage for the central engineering tradeoffs for the friction buffer connection engineering. Taper-zero connects sheet-to-sheet. 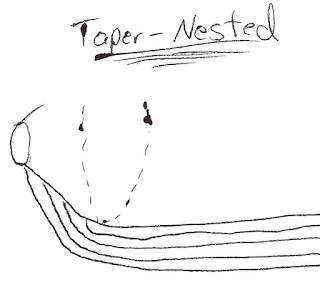 This taper-nested scheme connects sheet-to-hull. Making the connections to the hull will give better predictability and stability, because the other sheets and highly deformable. The advantage of the taper-zero approach is that the relative velocities at the connection points are very slow and consistent, while at the same time they are evenly spaced and open to atmosphere for maintenance. Now compare to the taper-nested approach. This scheme puts each friction buffer sheet fully inside of the next outer-most one. Getting to that connection to do service work on it will be much more complicated. Also, they will require awkward clustering toward the end if the relative velocity is kept constant. Alternatively, we can assume the constant distance spacing, and we find that the connection points have variable, and often quite high, relative velocities. This is riskier (but might be preferable with the advantage of the stationary hull), and it also imposes a meaningful air drag penalty. The additional air drag may be partially compensated for by increased spacing between sheets compared to the radially symmetric portion. We're not done yet. Recall the central concession of the taper-zero approach - that the friction buffer sheets must have substantial material strength. This is partly to compensate for the radial acceleration of the air in its region, but mostly as a design tweak to keep the seal at close to ambient pressure (thus the "zero"). For the taper-nested approach, leakage air is recycled from one stage to the next. That means that the sheets connect at a pressure which is already higher than ambient due to a non-zero radius. In taper-nested, you wouldn't strictly need holes in each sheet to allow ingress into the next stage, because the loss from one stage is also the loss for the next-most stage. My initial hope was the the material strength of the sheets would be lowered in the taper-nested scheme, but so far I have not been able to nail this feature down, and it could go either way. Jury is out on that topic. It is also not obvious that one is simply better than the other, and I may be hedging my bets between the two for quite some time to come.